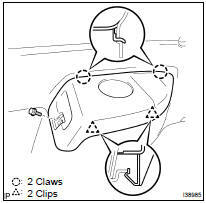 (a) Using a thin flat-head screwdriver with the tip taped up with protective tape, disengage the 2 claw fittings and remove the deck side trim cover front. (b) Release the 2 clip fittings and 2 claw fittings. (c) Remove the connector and deck side trim cover RH. (a) Remove the 2 screws and rear heater blower switch.